Rene Caris celebrates a win on debut with teammates Rocky Cranston and Jordan Ivey. With the AFLW season now come to an end, we take a moment to look back at each of the players on our list who made up our inaugural season in the competition. 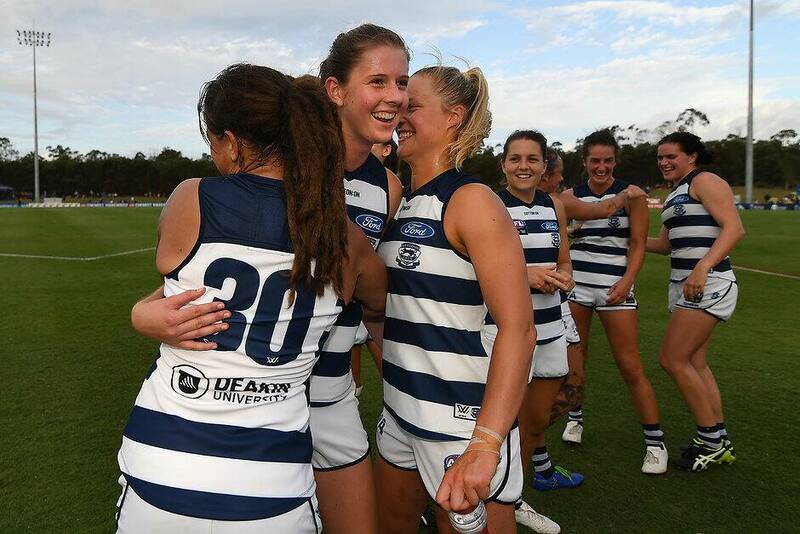 19-year-old Caris made her debut in round five against Brisbane where she played as a second ruck to Erin Hoare. Caris had seven disposals in her opening game and very nearly kicked a goal with her first kick in AFLW. Caris played the following week against the Fremantle Dockers where she five disposals. Orr played in all eight games this season shifting between the wing to the half forward line. She averaged eight disposals at 67% efficiency. Orr kicked a spectacular goal with her left foot from the boundary in the team’s Round 3 game against Adelaide. Danielle Orr gets a kick away against the Crows. Burchell made her debut in Round 7 against GWS in Round 7 after a frustrating run with injury throughout the pre-season. Burchell played on the wing where she had eight possessions. Blakeway played all games bar one this season, as a understated defender. Blakeway’s best game came when it counted in the Preliminary Final against the Crows at Adelaide Oval where she managed 13 disposals. Jordan Ivey compete's with Carlton's Maddy Prespakis for the football. Ivey was a consistent performer throughout the season. The tough midfielder/forward played every game. Ivey’s best performance came against her former club Carlton where she had seven kicks, four marks and eight tackles.